U.S. Sens. Chuck Schumer and Kirsten Gillibrand on Friday aligned themselves with legislation introduced by Sen. Richard Blumenthal, D-Conn., that would speed up Positive Train Control on passenger rail lines and tracks traveled by trains carrying crude oil or ethanol. Positive Train Control, mandated by Congress in 2008, is the railroad world's equivalent of an air-traffic-control system. It monitors train speeds, track conditions and whether trains are on the same track and about to collide with each other. PTC would have prevented the 2013 Metro North derailment around a sharp curve at Spuyten Duyvil in the Bronx, Schumer said. The accident killed four and injured 63. The legislation introduced Friday "makes sure railroads are transparent about their efforts" to install PTC, Schumer said. "Congress must pass this legislation so that railroads speed up implementation of this important new technology that will help slow down trains in event of an emergency." The Blumenthal bill, the Positive Train Control Safety Act, co-authored by Sen. Dianne Feinstein, D-Calif., is aimed at countering bipartisan legislation introduced last month by Sen. Roy Blunt, R-Mo., that would delay the December 31, 2015, deadline for PTC installation until 2020. The Blumenthal proposal would allow the Federal Railroad Administration to grant one-year deadline extensions to railroad lines on a case-by-case basis until 2018. It would also require PTC on any rail line used by tanker cars carrying oil such as Bakken crude from North Dakota or ethanol. 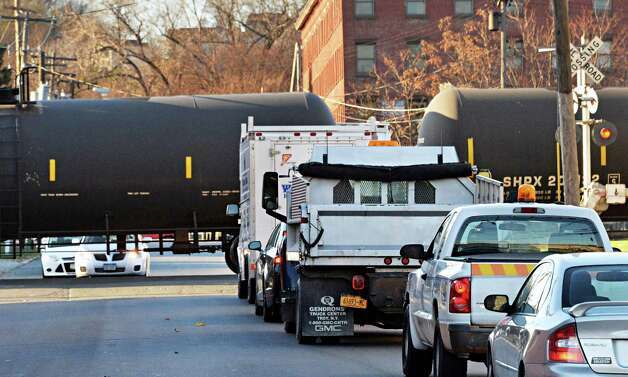 Rail transport of crude oil has been a growing concern in the Capital Region, with trains lumbering close to populated neighborhoods and many residents fearing they are accidents waiting to happen. Gov. Andrew Cuomo has urged stricter federal oversight of oil trains, and has had the state Department of Transportation up its inspections of trains, tracks and railroad infrastructure. But he has resisted calls to bar the trains outright, saying the issue falls under federal jurisdiction. The Department of Transportation on Friday issued an emergency order requiring trains hauling crude oil and other flammable liquids to slow down as they pass through urban areas. The Blumenthal bill also would beef up protections for rail employees in work zones along tracks and require commuter railroad employees to inspect tracks and sidings at various intervals. Two Metro North employees have been killed in recent years when trains struck them while working on tracks. Robert Luden died in West Haven, Conn., in 2013 and James Romansoff was killed last year in East Harlem. The legislation would also direct the Department of Transportation to study ways to use PTC and other technologies to reduce hazards at roadway rail crossings, a reaction to the accident in Valhalla. The rail industry's main trade group, the Association of American Railroads, called the 2015 PTC deadline "not possible'' to achieve and lobbied for an extension. "Unmanageable deadlines could result in higher costs and a disruption of service," Blunt said in a statement. "This bipartisan bill will help ease the Positive Train Control deadline to give railroads nationwide enough time to fully and safely implement this new technology.'' Joining Blunt were Sens. Claire McCaskill, D-Mo., and Bill Nelson, D-Fla., as well as Sen. John Thune, R-S.D. Blumenthal accused the rail industry of delaying tactics to avoid the cost of installing PTC. "The main obstacle to progress has been resistance from some of the railroads," he said. But AAR spokesman Ed Greenberg said railroads are "fully committed" to PTC.